BY THE END OF 2018, local town councils in Ireland should be able to purchase small nuclear power plants that could provide a carbon-free method of powering city lighting, electrical heating for council facilities and back-up power for emergency communications systems. The Hyperion devices, licensed by the US government, are smaller than an Irish garden shed, are factory-sealed, contain no weapons-grade material, have no moving parts and are impossible to steal because they are encased in concrete and buried deeper than a septic tank underground. Each Hyperion unit costs just under $25m. The leapfrog technology appeals to remote and isolated communities (like islands off the Irish coast) in Romania, the Cayman Islands, Panama and the Bahamas. Because the reactor is based on a 50-year-old design that has proved safe for university students to use on campuses in the States, few countries are expected to object to build plants on their territories. Each Hyperion device could power a building the size of the Dublin City Council offices for up to 40 years. 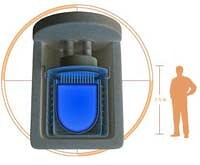 Next Energy News -- "Hyperion Mini Nuclear Reactor Set to Transform Power Generation"
Hyperion offers clean, safe, affordable power. WE HEAD TO DUBLIN for the IIA Net Visionary Awards programme today, expecting to know fewer than half of the people on the short list and no more than 20% of those in the Royal Hospital where the event kicks off tonight. Behind the scenes of our nomination in the education category sits a whole crew of people in Tipperary Institute who make my work possible. I'm on a creative multimedia faculty at Tipperary Institute whose ICT department has somehow avoided major restrictions in the way we get research funding for important initiatives. In today's fiscal climate, that may change and we will probably throttle back some of the travel we can subsidise for our students. We're already feeling a pinch in the administrative area, where I count on the thorough support of Paula Briody, Rita Clohessy and Yvonne Doyle. Every time we get an industry awards nomination, those people deserve to share the spotlight. So I'm heading to Dublin for the ceremony and that's grand. But the real mission is to find a Christmas hamper that I can give to our ICT support staff. That might not offset the effect of reduced funding for work-sharing schemes but it will be a way that I can say "thanks" for another year of exceptional support. EVERY WEEK, AROUND 9AM ON WEDNESDAYS, I join Krishna De and Ken McGuire to chat about things on the social media landscape in Ireland. It's not all social media and it's not just the three of us. Like today, I used my desktop Cisco phone to connect both Euan Semple and Roseanne Smith into the conversation. 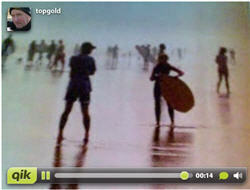 And then as the 52-minute call [36 MB MP3 file] developed, Ray rang in from Los Angeles. I'm learning a lot about trying to record a compelling conference call, especially in the area of getting decent audio. We're not producing a clean original file and as a result, some of my respected critics have tuned out of the show. They "tried listening" to a few episodes and then couldn't be bothered. Hearing their concerns has increased the standing of TWiT with Leo Laporte in my mind. Leo starts with good pipes from all his guests and has a way of modulating individual voices as he records his shows. The highest technology we have with Podcamp Ireland is a conference phone hooked into Blogtalk Radio. From the sound of things we've done, it might be time to move into an Irish phone conference call-in number, if only to reduce the latency and echo inherent when using the US VOIP dial-in number. After I listen to the enclosed MP3 file, I'll produce some show notes about the content. And I might even produce a four-minute audio version in 3GP format for mobile phones. In the meantime, I'd really appreciate your feedback on the value of recording a telephone conversation as a podcast with pointers to comments about Barcamp Cork, the New Media New Audience conference and a PRII social media workshop that I hope contains elements relevant to the social media classroom. 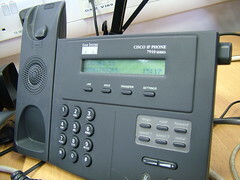 The Cisco 7910 phone shown in the photo has a three-year service life when used every day. EVER SINCE LEAVING REBOOT 9 (and the image at left), I've thought about ways to measure the electronic social interactions that form part of life. I approach social media from a technology side, trusting my choice of tools and networks to connect me automagically. Sometimes my perspective puts me at odds with purists who would claim that I could not possible have a meaningful relationship with my technological world, since elements in that world speak machine language. They often reconsider their criticism when I point to the loving caresses they reserve for their iPhones. And I also point out my decades-long relationship with aviation and automotive power plants. Those things talk to me and through their belching resonance, I have made enduring friendships. SINCE ST PATRICK'S DAY 2008, I have mulled over a post by Robin Blandford about "continuing the conversation" while swimming in different microblogs. Robin's aggregated commentary deserves to be part of a social media classroom conversation in Tipperary Institute and that's the major reason why I'm posting a reference to his thoughts here. I want to remind myself of the importance of training people through effective uses of social media tools, perhaps by looking at a day-long display such as that provided by Dipity above. You can click on the image to make it larger. Like Robin, I believe we are "already reaching capacity with how much online chatter we can handle." And I don't know anyone outside of my small little world of tweeple (people addicted to Twitter) who wants to carry around a computing device to stay abreast online chatter. Robin Blandford -- "Microblogging: Continuing the Conversation"
Previously -- "Multi-channel microblogging" on InsideView, 18 May 2007. IN LATE 2001, when I first started blogging, I remember how adamant I felt about keeping my blog posts local (on my laptop) because that was the only way I could hold claim to the content. I bounced between several hosts, not knowing who would be around in a year or two and I really wanted to keep my content in a place where I could touch it. Back then, I kept Radio Userland running on my laptop and I could watch my hard drive fill up with XML content from Radio as I clicked through 1000 blog posts. I remember talking with Karlin Lillington and Gavin Sheridan, both Radio Userland bloggers in the early days, as we tried to figure out how to uncork Radio when it just didn't want to publish to the online site. 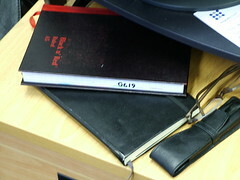 Karlin, the journalist, pointed out that writing a blog post was meaningless unless it could be accessed from anywhere. You had to publish online if you wanted to connect to others in a meaningful way. Some of the motivation that pushed me to try Blogger and then Movable Type lay in the idea that both of those systems shoveled your work directly to the global cloud of bloggers. By their very nature, their blogging architecture made blogging more accessible. IN MY WORLD, if it syncs to my phone, it's going to get done. That means music I want to buy (after scraping it via line-out of my laptop), podcasts that educate, and calendar items that point to best use of my time. 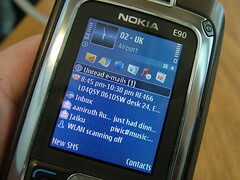 It's dead easy to download music onto my Nokia E90 over my O2-Ireland 3G connection, across the room with Bluetooth, or through simple drag-and-drop onto the phone or memory card. While I don't think the iPod is going to an early grave, when the recession bites, some people are going to see more value in buying a phone that can double as their entertainment device instead of buying a dedicated music player. I personally like SonyEricsson's music phones because they give me the best control of the bass line along with proper rich media streaming capability and the best Bluetooth earbuds in the business. 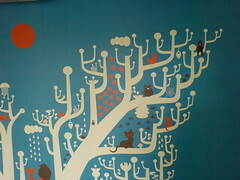 But I like the podcatcher on my Nokia E90 better than the SonyEricsson one. After more than three years of messing around with RSS feeds, I can control my audio programming better than iTunes can manage it for me. I don't know if I represent any significant factor in the way music will be distributed in the next decade. However, I see creative multimedia college students making some decisions where they are actively tuning out the national broadcaster. Their habits will profoundly affect radio. I wonder if the "New Media New Audience" conference in Dublin has scope to address this issue. I'm carrying a new media distribution device in my coat pocket when attending the talks. I'm keen to chat with anyone who shares my concerns about the way my mobile earbuds may portend a change in how we consume media. Irish Arts Council Conference on "New Media, New Audience?" TOM SYKES JOINS ANDREW KEEN in his disdain for amateur journalism, pointing to "Wired which carries, in its most recent issue, an obituary of the blog." Sykes is an "inky-fingered newsprint" reader and he revels in the thought that blogging is dead. "Thank goodness for that," he writes in the Irish Examiner. "While this may be the reason that geeks have stopped reading blogs, I suspect the reason the average reader has quit is a bit simpler: they're rubbish." On this note, both Tom Sykes and Andrew Keen would share a chair on the stage of the Irish Arts Council's New Media Conference. Keen is recognisable as an ultimate blogging cynic. Sykes is more a local boy, relegated to "The Last Word" in the Monday morning edition of the Irish Examiner. The Irish Arts Council will pay Keen to fly over from London for his viewpoints but I don't think more than one person from County Cork will be paid to travel up to Dublin address the Arts Council's New Media Conference next month in Dublin Castle. If the idea of trekking to Dublin doesn't float your boat, you might enjoy reading over tweets from ect08, an event that caused me to think about effective uses of social media. Irish Arts Council -- New Media Conference on Tuesday 25 November in the Dublin Castle, site of a few of my most-favourite images on Flickr. Annette Clancy -- "New Media New Audience"
Tom Sykes vented his happiness in "The Last Word" column in the inky print edition of the Irish Examiner, 27 Oct 08. Set your GPS for Castle Street, Dublin, Ireland: 53.343, -6.2676 which happens to be PON Code MT9 3HT. Memory from Pennsylvania | Photo from The Telegraph. AFTER CLEANING A NEIGHBOUR'S swimming pool, I used to find all sorts of interesting things--like spiders and frogs and turtles. 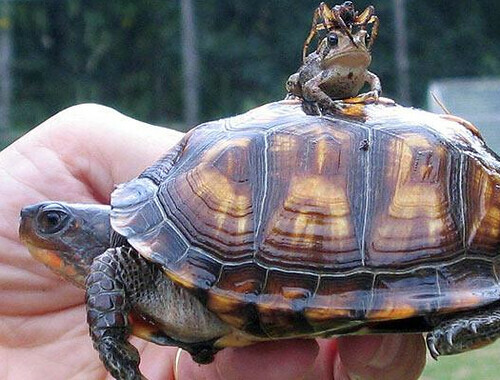 But not one on top of another like a guy found in Virginia recently. Bernie Goldbach has turtles in his journal.